Jackson Pollock, often considered the most important figure in the Abstract Expressionist movement, began to study painting in the late 1920s at the Art Students' League after following his eldest brother, Charles, to New York City. Thomas Hart Benton, one of the pioneers of the Regionalist art movement, had a major influence as a teacher during this time. 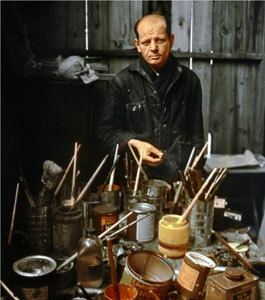 Pollock worked in the manner of the Regionalists during the 1930s, and he was also being influenced by the Mexican muralist painters and by certain componenets of Surrealism. It has been proposed that Pollock was influenced by Native American art, specifically sand paintings that were composed of dribbling thin lines of color on a horizontal surface. In 1943, Jackson had his first solo exhibit. Peggy Guggenheim sponsored it and guaranteed him a salary of $150 a month. He married artist Lee Krasner in October of 1945. Pollock’s patron and art dealer, Peggy Guggenheim, lent then the down payment for their house in Springs on Long Island. Their house had a shed to serve as Jackson’s studio, and Lee painted in a room in the house. The "drip style" for which he is best known is first documented in 1947. He put his easels aside, fastened his canvas to the floor or wall, and then poured and dripped the paint from a can. Sticks, trowels and knives took the place of brushes. Sand, broken glass and miscellaneous foreign matter would sometimes be incorporated creating a heavy impasto. When asked about his painting technique, he said “I prefer to tack the unstretched canvas to the hard wall or floor… On the floor, I am more at ease. I feel nearer, more a part of the painting, since this way I can walk around it, and work from the four sides and literally be in the painting.” As for his tools, “I continue to get away from the usual painter’s tools such as an easel, palette, brushes, etc. I prefer sticks, trowels, knives, and dripping fluid paint or a heavy impasto with sand, broken glass, or other foreign matter added.” This manner of Action Painting was supposed by artists and critics alike to result in a direct expression or admission of the unconscious moods of the artist. Pollock was one of the creators of this new All-over style of painting, which avoided any points of emphasis or recognizable parts within the whole canvas. These artists abandoned the traditional notion of composition in terms of relations among parts. During the 1950’s , his work became so well known in America that he had a four page spread in Life Magazine that asked if he was the greatest painter alive. In an interview, he was asked how this came to be and he replied “The method of painting is the natural growth out of need. I want to express my feelings rather that illustrate them… I can control the flow of paint; there is no accident, just as there is no beginning and no end.” He was strongly supported by progressive critics, but was also subject to much abuse and cynicism as the leader of a still little comprehended style. Time magazine labeled him `Jack the Dripper' in 1956. Jackson did not paint much from 1952 to the end of his life. He had been a heavy drinker all his life, which started to catch up with him and put a strain on his marriage. Lee went to Europe to try to put things in perspective. Pollock, on the other hand, stayed in town, and frequented bars with friends. Jackson Pollock died on August 11, 1956 at 10:15 pm when he flipped his Oldsmobile convertible. His mistress, Ruth Klingman, survived the crash but her friend Edith Metzgen also passed away. Pollock was buried at the Green River Cemetery near Springs where they lived. Their house is now the Pollock-Krasner House and Study Center. By the 1960s, Jackson was generally recognized as the most important figure in the most significant movement of this century in American painting.